Have you ever known that fish make better scientists than men?Or that hair can do such terrible things to your skin, the universe, and everything that exists?Or that cool characters can leap out of what feels like a D&D campaign and flip scifi-comedy upside down?TROLLS aren't just the masters of clubs, but also transient computers.So, I finished this a while back and honestly thought I'd reviewed it. Sorry Mr. Bubba, but I don't know if I can be as detailed as I want on memory alone. I'll just recommend this book openly. Don't worry about it being a sequel. Get this book in your brain because it shows you a bunch of funny pictures while surprising you with interesting characters. I mean, writing this review right now, I just realized that in my latest project the main character has hair that moves mysteriously, an imperious queen, and a dragon that bullies a- oh wait. No, I didn't do that. I would never make a mean dragon. Honestly, the hamster cheetahs had me in stitches. Oh, and it's all about a girl that hops dimensions.This review is all over the place, but in a way, the book's perspectives do that too. In the best way! It's like being attacked by a comedy ninja who has way too many throwing stars. And he's using a shotgun to shoot the stars. Yeah, that's what it felt like. Everything in the multiverse is functioning normally. Then, with one malevolent experiment gone awry, the multiverse cracks. The damage is spreading and universes are colliding. Oh, the trouble that hair can cause.To start, the author presents a variety of characters within several story arcs. Each arc is distinctly unique, and all are initially unrelated. The consequences of one central event does eventually reach all the story arcs. The biggest challenge for the reader is to handle all the characters and settings in the beginning. After several of these you find you are losing immersion to the early characters with their absence from a combined storyline. This, coupled with the unusual behaviour and strangeness of the characters will require some serious concentration. It takes about three chapters to come back to the first characters introduced in the beginning. Once I saw the relevance of each character in the overall arc, I was much more comfortable with the reading.To be fair, the author is writing in the Sci-Fi genre and elements such as time and human norms are twisted and tossed about. Due to the multiverse concept, the author experimented with ‘what ifs’ and explored the interactions and dynamics of a variety of possibilities. What if a man were to become a host vessel for a symbiote whose form was comprised of long, shimmering, grasping cantankerous hair? What if the symbiote shared motor and speech functions but thought independently? This is just one example of the experiments born from the laboratory of the author’s mind.I really enjoyed the ease in which the author entertained with humour. There is some fun comedic moments that arise as a result, such as (and not limited to) psionic slapping fish. The humour is light-hearted, slapstick and zany. Each story arc has value, humour and interest. Unfortunately there were too many for me to tackle without going back and trying to find out where they introduced/developed/tried/managed. I recognize that this is book two in a series and that some characters may also have been introduced previously. I took that into consideration when determining my rating.Overall, I refer this work to those who like the idea of a narrative puzzle to be solved and laugh along the way with quirky character interactions. As has been suggested by others, this fits right into the realm of Douglas Adams style of writing. I was given a free copy of the book for a fair, non-reciprocal review. Disclaimer: I received a free copy in exchange for an honest review.Two words: Pleasant confusion.I read this book in stasis, without reading any associated parts. It is fantastic, amusing, and wildly experimental. It is like a mass of turning threads which eventually link up, and will make little sense for a good long while. After that, it picks right up and most of the scattered pieces come together.Watch the queen terrify poor snats, root for Boil's superior intelligence, and contemplate the truth of time with a number of debating temporal fish while a sassy horse talks itself into being ridden.I believe this book's biggest asset was the characterization, while its flaws lay in pacing. Still, it was an absolute pleasure to read. 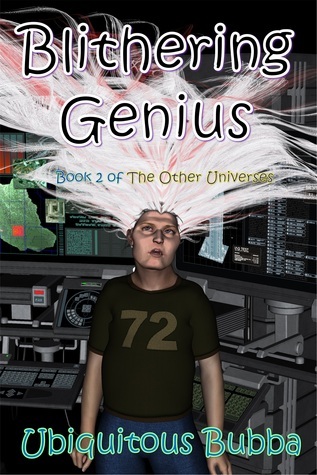 Blithering Genius is a science fiction/fantasy novel that is the second in the Other Universe series. The prologue opens in a padded cell with a child (who may or may not have multiple heads, and possibly be named Aaaagh) being questioned about a viral video by a psychologist. Chapter 1 catapults the reader into space, introducing a plethora of fantastical characters with equally fantastic names: Queen Plithergaflerd, Rog, Thelonius (a wizard), Psychann, Cheesters (genetically engineered beasts), Sir Reginald, a dragon, teleporting psionic fish, a trio named Skippy, Scurvy, Slug -- and a dwarf – to name just a few. The spaceship Chaos Effect is on a “transuniversal” quest and these characters serve the Prime Universe under an evil sounding Overseer. The concept of Time is played with from the beginning, referred to as the“Fornever.” Author Ubiquitous Bubba has a zany writing style that contains lots of humor akin to the satire in Hitchhiker's Guide to the Galaxy. Although the introduction of so many characters may be somewhat confusing, the story does eventually connect back to the child readers met in the prologue and the viral video she was allegedly a part of. Readers who enjoy science fiction/fantasy that is quirky and imaginative will have a unique experience with this novel. Although, I love science fiction book Blithering Genius I was totally indifferent. Too many characters, the plot is so confusing and simply hard to read. No matter how hard I try writer failed to attract me to read. All in all, the book is full of strange characters: Queen Plithergaflerd, Rog, Thelonius (a wizard), Psychann, Cheesters (genetically engineered beasts), Sir Reginald, a dragon, teleporting psionic fish, a trio named Skippy, a horse that talks, hair operates with its owner, spiders, computers that manage people and not to mention all of them. Although me for a few moments writer managed to laugh, they were only moments. I wish I could give a better review of books but I think it is for me too confusing, but there is always a reader of science fiction that could be like this this book. "Copy provided courtesy of the author in exchange for an honest review." Ubiquitous Bubba - Ubiquitous Bubba (if that's his real name) spends a significant amount of time surrounded by imaginary characters from bizarre universes. He's been known to hold conversations with animals, inanimate objects, and food. These discussions frequently diverge into philosophy, speculations on Reality/Unreality, and the proper role of cheese in society. Growing up in Texas, he studied the lore of the Storyteller, the mysterious art of the tall tale, and the pervasive universal existence of Bubbas. They're everywhere. As he wandered universes, he discovered that there's always a Bubba around when you need one. Ubiquitous is also a drummer, who has somewhat narrow and specialized musical tastes. A fan of progressive and hard rock styles, he's also known to incorporate some funk just to keep himself entertained. Ubiquitous Bubba enjoys relaxing at home with his wife and kids. He enjoys telling stories, eating pizza, and holding the recliner down. It hasn't gotten away yet, but one can't be too careful.